This is excerpt No. 17 (of 45) from America’s Right Turn: How Conservatives Used New and Alternative Media to Take Power, by Richard A. Viguerie and David Franke. Lists are the lifeblood of direct marketing, and that is as true for political causes as in any other commercial or nonprofit area. In this excerpt I tell how I started growing the conservative movement with the names of Goldwater contributors, and kept adding and adding lists. Using these lists, conservatives grew—step by step—under the radar of the liberal establishments. By the late 1960s other conservatives were also utilizing direct mail for their causes. But when it came to broadly funding a mass movement through direct mail, I pretty much had the field to myself from 1965 to 1978. 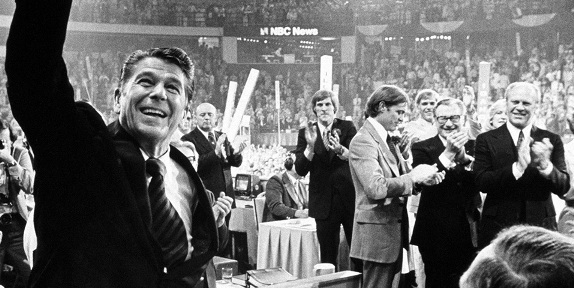 We didn’t realize how much the conservative movement had grown – and the establishment certainly had no clue – until the pivotal elections of 1978 and 1980. Of all the problems that I had in these first years as a direct mail fundraiser, number one was the lack of identified conservatives on mailing lists. Today I have, in my desk, a book-size file of several hundred conservative mailing lists. Back then we had only a handful of conservative mailing lists. And lists are the lifeblood of direct marketing. After several years of living on a near-starvation diet of names to mail to, I saw a (pardon the pun) golden opportunity in the Goldwater campaign. At that time, federal political campaigns had to register, on a quarterly basis, the names and addresses of all persons who contributed $50 or more to the candidate. The list was kept on file with the Clerk of the House of Representatives, and you could look at the list in the clerk’s office. I decided to do more than look at the names and addresses. I copied them laboriously by longhand, one contributor after another. This soon turned out to be more time consuming than I could handle, so I hired a half dozen or so women to do this for me. The clerk and his staff eyed us suspiciously, because nothing like this had ever happened before. But there didn’t seem to be any law saying we couldn’t copy the names and addresses. Finally the clerk decided he had better cover his rear flank and told me we couldn’t copy names anymore – he just wasn’t comfortable with it. If I had known then what I know now, I would have kept the operation going and said, “Talk to my attorney.” But we packed up our yellow pads and complied with his order. Luckily, we got most of the Goldwater donor names before the clerk’s nervousness shut us off. The total list was something like 15,000 names, and we had 12,500 of them. Since they had been reported on a quarterly basis, we had a nationwide list of the early responders – the most ardent Goldwater supporters in the nation. And that list was my treasure trove, as good as the gold bricks deposited at Fort Knox, as I started The Viguerie Company and began raising money for conservative clients. People sometimes say, “It was the computer that allowed Viguerie to pioneer political direct mail.” That’s not really true. I could have done what I did without computers, using any of the old technology, such as Addressograph or Scriptomatic. Lists are the lifeblood of direct mail, and I now was the sole possessor of the best list in the nation for raising money for conservative causes. I also knew what to do with that list. Conservatives were not a major concern to the establishment in the years immediately following 1964. We were a convenient punching bag, good to beat up on when they needed to show that a particular issue or position was too “radical” to be taken seriously. The Republicans had to throw us a few crumbs, but they didn’t consider us to be a serious threat, and for good reason. We had been trounced, and they assumed that was the end of that. No more forthright conservatives running for national office. Under the establishment’s radar, though, we kept busy and kept growing. Even if the pace of growth was agonizingly slow, we hoped and trusted that at some point we’d reach a critical mass where we could make a big difference in the national political agenda. I kept adding to my list of conservative donor names. My contract with any client would give both the client and me the use of donors’ names, which was critical in expanding the base of the conservative movement. It had the effect politically that free trade has economically – it made for easy market access across borders (in this instance, organizational borders) since I was, in effect, the NAFTA framework governing conservative lists. If I thought the donors to group A would also be likely to contribute to group B, I’d test my hunch with a mailing. Group B obviously would benefit from the additional donors, but this helped group A as well, since it would be just a matter of time before we used the B list for a mailing to benefit A, not to mention the lists of new organizations C, D, and E.
Just as free trade dramatically expanded the world economy in the second half of the twentieth century, so my “common market” of conservative names expanded the conservative universe. I didn’t realize it at the time, but I was a “supply-sider” before that term came into use. I remember vividly how old-line conservatives would tell me there were “only” 125,000 (or whatever number of) conservatives in the nation who would contribute money. Starting new organizations and publications, according to their logic, meant that each conservative cause would get a smaller piece of the finite pie. I said to myself, and to them, that we were in deep cow chips if there were only 125,000 dedicated conservatives in a country of over 200 million people. If that were the case, I might as well sell my business and do what I really enjoyed doing – spending time with my family and playing golf. But I knew that in politics, as in economics, the key is to keep that pie growing bigger and bigger. At first it was slow going, but with time the pace picked up. Around 1966 Marvin Liebman decided to get out of the conservative PR business and pursue his first love – the theater – in London. I bought his entire donor list of about 50,000 names. I remember how my wife, Elaine, and I drove to New York and filled up the trunk of our car with 50,000 Addressograph/Scriptomatic metal plates. I now had a total file of over 150,000 conservative donors. The foremost theme with most of my clients could be summed up as “stand up to communism.” This was the big issue of the era that eclipsed all others. Some of my clients worked entirely in the foreign policy arena – among them John Fisher’s American Security Council and Ted Loeffler’s World Anti-Communism League. But anti-communist issues were also pivotal for broad-based early clients such as the American Conservative Union. In another policy area, I had great success raising money for H. L. (Bill) Richardson’s Gun Owners of America and Gun Owners of California, where he was a state senator. The National Right-to-Work Committee and its foundation, as well as the National Rifle Association, were also major early clients. I wasn’t the only conservative utilizing direct mail by the late 1960s, by any means. In New Rochelle, New York, Neil McCaffrey was using his previous direct mail experience with the Macmillan publishing company to build his Arlington House Publishers and the Conservative Book Club. The National Review crowd was using direct mail to build the magazine, the Conservative Party of New York, and other vital efforts, such as Bill Buckley’s race for mayor of New York City in 1965. California – and particularly Orange County – was a hotbed of conservative political activity, with direct mail playing a role, though not as big a role as it would assume later when I took on Max Rafferty’s campaign for the Senate. And out of St. Louis, Phyllis Schlafly was zeroing in on Richard Nixon’s front man, Henry Kissinger, for appeasing the communists (this was before the Equal Rights Amendment caught her attention). She was particularly adept at using GOP and women’s organizations to grow her movement, but she also used direct marketing. Although it’s true that other conservatives were using direct mail, when it came to broadly funding a mass movement through direct mail, I pretty much had the field to myself from 1965 to 1978. Wyatt Stewart had left my firm in 1977 to work for the GOP Congressional Campaign Committee, and he now offered me an opportunity to raise money for them. I turned down his offer because I wasn’t happy with the drift of the Republican Party and didn’t want to be co-opted by the GOP establishment; I wanted to be free to criticize the GOP and keep pulling the party to the right. Then Stewart repeated the offer to Steve Winchell, who was my executive vice president. Steve accepted, and went on to raise a ton of money for the Republicans. Stewart and Steve took the various Republican fundraising entities from around 25,000 names in 1977 to about two million by November 1980 – a phenomenal accomplishment. This played a significant role in Reagan’s landslide election and the GOP’s capture of the Senate. Stewart and Steve now gave me serious competition in political direct mail, but we were appealing to two separate but mildly overlapping universes – conservatives and Republicans. As the conservative movement grew, a number of other executives would leave my firm after learning the business to set up shop on their own. I started saying then, as I say now, that I don’t run a direct mail agency so much as I run a university. All of this was a sign that the conservative movement was growing and maturing into a political machine too large to be funded by one advertising agency. We didn’t realize how much we had grown – and the establishment certainly had no clue – until the pivotal elections of 1978 and 1980.